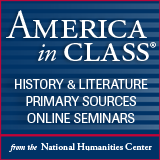 The National Humanities Center is pleased to announce their spring schedule of live, online professional development seminars, free for California history, literature, and humanities teachers. Led by distinguished scholars, the seminars explore historical documents, literary texts, and images to demonstrate and support teaching with primary sources. Seminar materials are free, online, and available on-demand. Each National Humanities Center seminar provides three hours of professional development, and educators can earn one university credit, exclusively at CSU, Chico, upon completion of five NHC seminars. View the complete spring 2015 schedule and read more about the program.